WELCOME TO THE ABBEY RETREAT CENTER - NOW OPEN FOLLOWING A COMPLETE RENOVATION. For more than 50 years, the Retreat Center has offered men, women and married couples the opportunity to step back from their busy lives and find quiet time for reflection and prayer on the beautiful 1,100 acres of Saint Joseph Abbey. 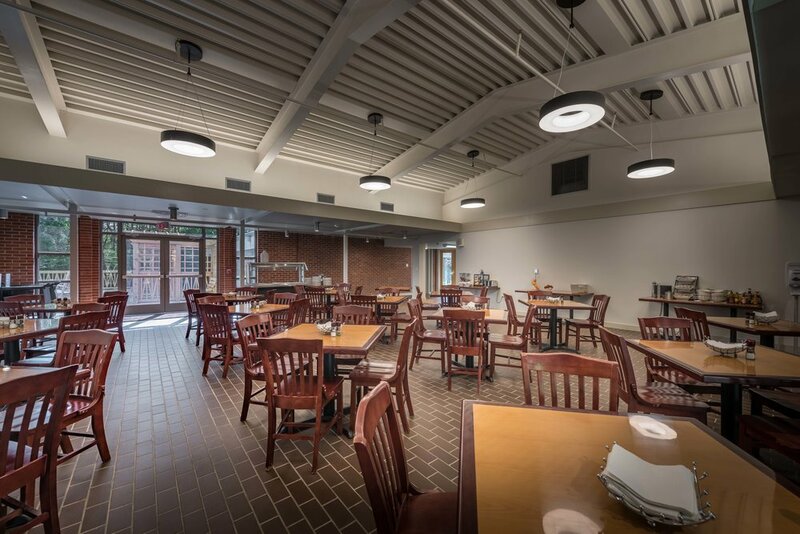 Although the 2016 flood delayed the intended renovations of the Retreat Center’s bedroom wings, now the whole facility has undergone a $3.5 million overhaul. Reopened this past January, improvements to the retreat center include new, larger bedrooms. Each bedroom now has a queen-size bed and pullout sleeper sofa in the event someone would like to share a room, a larger private bathroom and an independent air conditioning/heating thermostat. Furthermore, all of the windows in the Retreat Center have been upgraded to double-insulated glass and the building incorporates the original roof design in order to qualify for historic tax credits. Photos by Michael Palumbo of the renovated Retreat Center can be found below. Saint Joseph Abbey is located on a 1,200-acre site four miles north of Covington, LA. At the Retreat Center, the monks extend their hospitality to groups who seek the peace and solitude of a monastic setting to develop their spirituality. The surrounding grounds and pine forests offer opportunities for quiet and reflective leisure to each retreatant. The Retreat Center welcomes people of all faiths (18 years or older). Retreats have been hosted here for over 50 years, and we continue to offer Abbey-sponsored league retreats for Men, Women, Married Couples and Mixed Groups. The Retreat Center is available to outside groups. Following renovations in 2017, the Retreat Center can now accommodate 60 retreatants in double occupancy rooms (30 single occupancy), each with a private bath. The Retreat Center houses all guest rooms, chapel, library and dining room under one roof. All meals and linens are provided. You are welcome to join the monks in prayer in the Abbey Church. Registration for all retreats is available by clicking the individual retreat category links, located on the upper left hand side of this page. To reach the Retreat Center Office, please call 985 892-3473 or e-mail us at clc@sjasc.edu.